Fancy a spider pakora? This machine has more tasty insects in it! 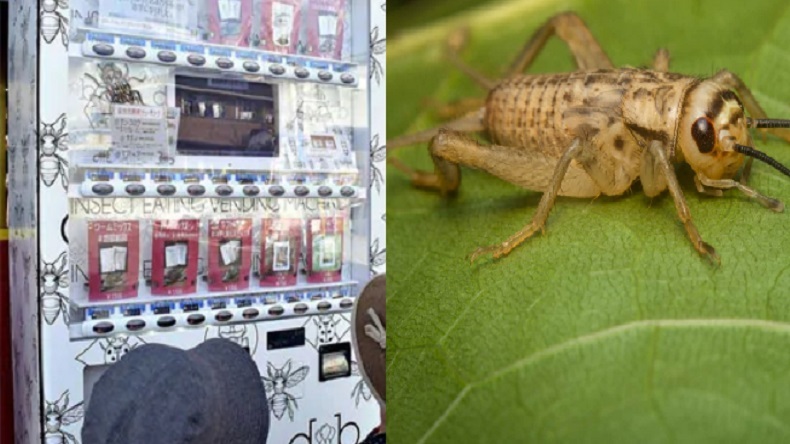 Toshiyuki Tomoda of Japan has set up a vending machine selling 10 insect delicacies. He is offering bugs to people in order to help them understand the importance of food during a time of food shortages. Insects are part of the diet in India too, with some cultures liking them for their high protein inputs at a cheap price. This may sound offensive to some, but have you ever tasted crickets, unicorn beetles and tarantulas? 34-year-old Toshiyuki Tomoda of Japan came up with this gem of an idea to help people resolve food shortages. A balloon shop owner in Kumamotot city set up the insect vending machine outside his store earlier this month. His fondness for having insects with his meals due to food shortages and environmental issues created a buzz on the Internet. Tomoda, reports said, spoke to his friends in late November before selling insects as snacks to customers through a vending machine. Talking about the menu that offers over 10 insects, including a cheap protein bar that contains powdered crickets sold for 700 yen (less than Rs 500). He sells salted crickets at 1,300 yen per package as well as canned tarantula for 1,900 yen. Tomoda said he likes the flavour of crickets, shrimp and other crustaceans with mayo and pepper. He hopes the machine will make people understand the importance of food in a time when shortages abound. People in several parts of the world eat insects including in India. The winged termite is a particular favourite of people in southern Tamil Nadu where it is eaten fried and with a smattering of spices. In Chhattisgarh, Gond tribals relish a chutney made of red ants and in Bodoland, caterpillars and other creepy crawlies make for a decent snack. But for a spider pakora, we may have to wait just a wee bit!